Dommage le manque de tarifs pour les professionnelles. Good service with fast shipping, no problems. First time I've ordered, so was surprised that there were 2 packages; I thought you'd duplicated the order. Might be useful to include some instructions for dummies. Battery, delivery etc. all fine. Very proumpt delivery but No instructions sent with battery? pleased with prompt delivery. I have not put the battery in the car yet. Will do so soon! No platic terminal insulation caps fitted .I used the ones from the old battery. Good battery, Good service from Tayna.Last one lasted 8yrs, Hope this is similar! So far, it works fine. Very quick delivery. Price OK. I was impressed by the phone call which followed up my on-line enquiry. I hope it lasts longer than the similar 501 from another supplier which went down after only 18 months. Would be 5 starts but it arrived full of acid ..... and with 4 bottles of acid which I now have to get rid of. 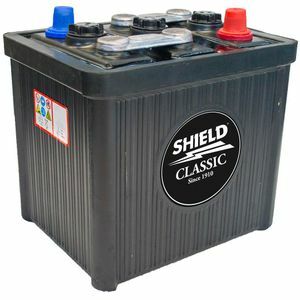 An excellent "vintage" battery with modern performance and first rate service from Tanya. I have recommended them to the Lancia Motor Club.